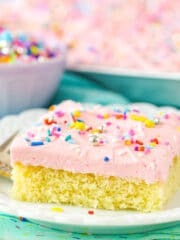 This Vanilla Sheet Cake is a wonderfully moist and fluffy vanilla cake recipe that is easy to make! 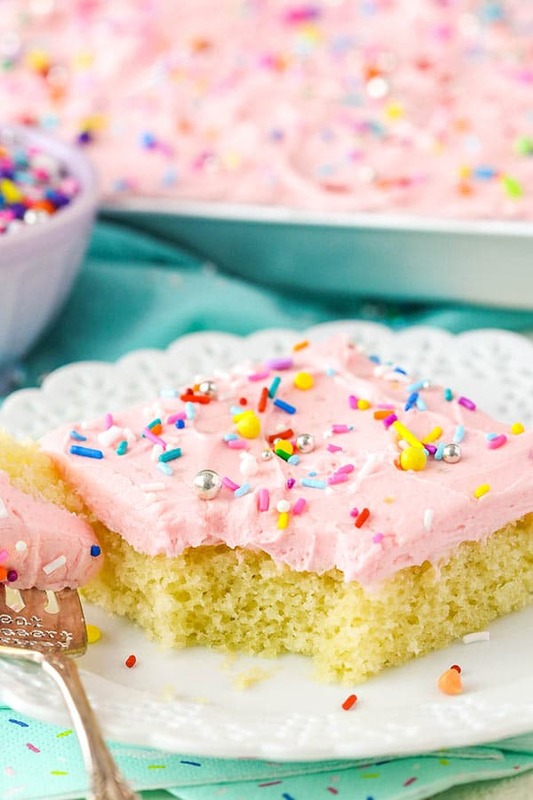 It’s covered in a creamy vanilla buttercream and made in a 12×18 inch pan, so it’s perfect for a crowd! Is it weird that I’m already starting to think about what I’ll do for the boys’ first birthday? Yes, they are just over 6 months old, but they are already starting to show preferences for things and gravitating towards certain foods and toys, so themes are popping into my head. If you’re like my mom, then you don’t understand the whole first birthday party thing and why people make a big deal out of it when the kids don’t even remember it. Well I’ve discovered as a new parent to twins that the real reason for a first birthday party is not for the kids – it’s for the parents. When we make it to that one year mark, it’ll not only be a celebration of a whole year with those sweet boys, but a celebration that we made it! These early months are precious, but boy are they hard too! Especially with two! One thing that’s great about sheet cakes is the ease of making them. You know I’m a lover of layer cakes, but when baking for a larger group or with only a little time to prepare, sheet cakes are handy to have. 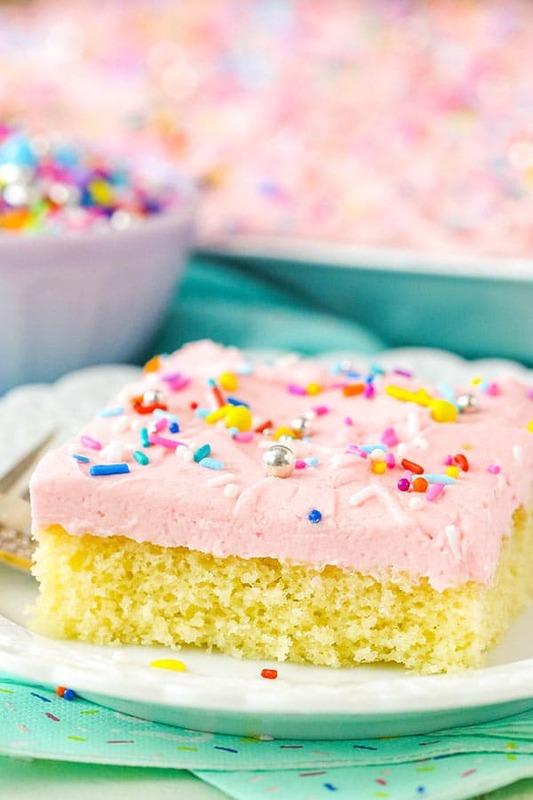 To get started with this vanilla sheet cake, you’ll want to cream your butter, sugar and vegetable oil together until they are light in color and fluffy. Don’t skimp on the creaming – it adds air to the batter that gives the final cake part of its fluffy texture. The butter adds great flavor and moisture to the cake, while the vegetable oil adds some additional moisture that sticks around for days. The remaining ingredients are all staples – eggs, vanilla extract, flour, baking powder, salt and milk. I chose to go with all purpose flour and regular milk, but I also tested this sheet cake with cake flour and buttermilk. The hubs and I really preferred this cake with the all purpose flour, but cake flour was also delicious. The texture is completely different! The all purpose flour gave a looser crumb, while the cake flour was tighter and reminded me a little more of a “bakery-style” cake. Even though we had our preference, you really couldn’t go wrong with either. As for the milk, I liked both but didn’t see enough difference using buttermilk to use that as the final ingredient. While I always have buttermilk powder handy and ready to use, most people don’t and for the purpose of keeping this sheet cake simple and approachable, I stuck with trusty, classic milk. The frosting is a lovely, light vanilla buttercream. I added a little corn syrup to it, but you could substitute that with a little honey. The corn syrup helps keep it soft and smooth and perfect for topping a light cake! I finished it off with some fun sprinkles, because what birthday cake doesn’t have sprinkles? This vanilla sheet cake was a BIG hit! It is so soft and moist with a tender crumb. The flavor is rich and buttery with great vanilla flavor. Everything just melts in your mouth. I shared a good bit of this cake with a friend and I dare say we took forks to it and left few crumbs behind. It’s totally addicting and so delicious! 1. Prepare a 12×18 inch sheet pan/jelly roll pan with non-stick baking spray. Preheat oven to 350°F (176°C). 3. Add the butter, sugar, and oil to and large mixer bowl and beat together until light in color and fluffy, about 3-4 minutes. Do not skimp on the creaming time. 4. Add the eggs two at a time, mixing until mostly combined after each addition. Scrape down the sides of the bowl as needed to be sure all ingredients are well incorporated. 6. Slowly add the milk and vanilla extract and mix until well combined. 8. Spread the batter evenly into the prepared pan and bake for 12-15 minutes, or until a toothpick comes out clean. 9. Remove the cake from the oven and allow to cool. 11. Slowly add half of the powdered sugar and the salt and mix until smooth. 12. Add the vanilla extract, corn syrup and 4 tablespoons of water or milk and mix until smooth. 14. Color the frosting to your desired shade. I used a little bit of pink, peach and ivory gel icing colors. 15. 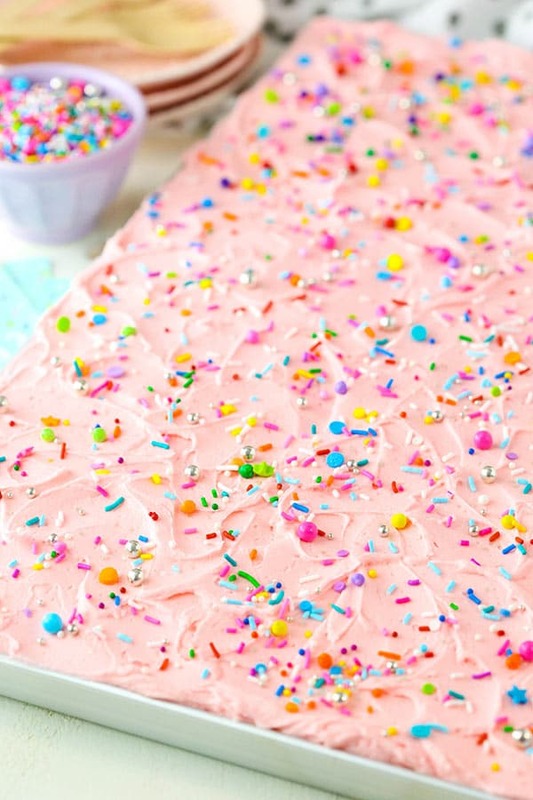 Spread the frosting evenly onto the cooled cake and then top with sprinkles. Cover the cake well and store at room temperature. Cake is best when eaten within 3-4 days. * I like to use some shortening with the butter for reasons you can read about here. Feel free to substitute it with additional butter, but keep in mind that you might want to refrigerate the cake and frosting. This looks lovely and m going to try it for my kids. The largest pan I have is a 13×9 would I need to alter the recipe in any way? Don’t know if my pan may be too small. That should be fine. I’d try baking it for 25-30 minutes. Yes, this recipe can be make as cupcakes. Fill the liners about half way and bake for 18-20 mins at same temp. I would recommend checking out my Favorite Moist Vanilla Cups recipe as well. Your recipes all look totally mouthwatering! Have you ever tested any of your recipes in a dairy-free version, like with earth balance buttery flavored sticks or margarine, soymilk, non-dairy whipping cream, etc.? No I haven’t actually, I’m sorry! I made this dairy free using almond or coconut milk and vegan margarine, everybody loved it and no body would know it was dairy free! I plan to make this many more times! What did you substitute the eggs with? where did you get those sprinkles? They look wonderful! I’ve been following your blog for over a year. You are so creative and your recipes are fabulous. I’m thrilled that you share your love for God’s word too! Keep on being that Prov 31 gal and may the Lord continue to bless you, your family and your blog. Great job! ???? I made this cake over the weekend and it is fabulous! I was a little afraid it would be bland but it has a wonderful flavor and is, unfortunately, the kind of cake you keep going back to – just one more tiny piece every time – until you notice how much you’ve eaten! 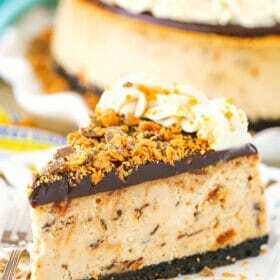 I’m going to make it for my church picnic this Sunday. Thank you! Awesome! So glad to hear that! Thanks Karin! Help!!! I only have white wheat flour!! Bugs were in my all purpose flour! Do I need to anything different to this recipe using white wheat fflour? I need to make a half sheet cake. I haven’t ever used a wheat flour in a cake, so I really don’t know. I’m sorry. Hello! Awhile back I made your moist vanilla cupcakes. WOW! Amazing. 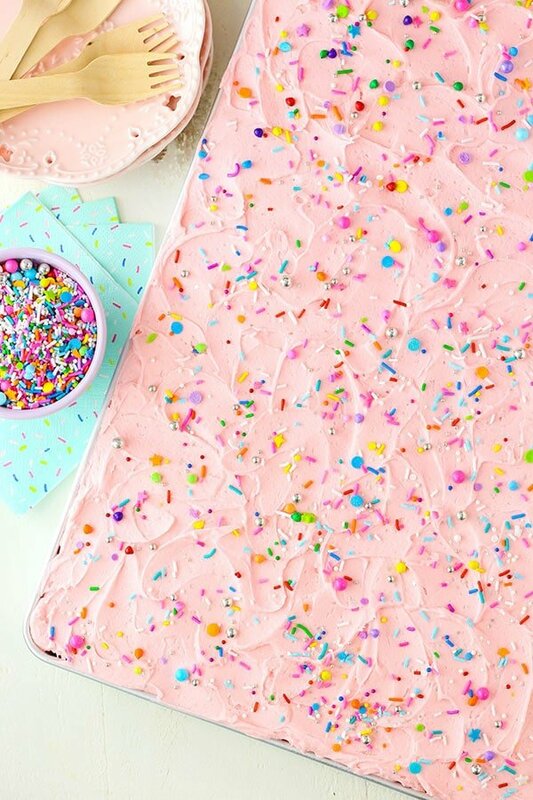 Anyhow, I have a couple bdays coming up and would like to try this sheet cake recipe. Question: Should I double this if I want to use a 12×18 sheet but with 2 inch sides? I am wanting a nice thick sheet cake. TIA! So glad you enjoyed the cupcakes! If you’re looking for this cake to actually be about 2 inches thick, then yes I’d try doubling it. I haven’t ever tried it before, so you’ll want to test out things with the baking time. The cake looks really delicious. Can you give me the name of the 12×18 cake pan. I want to make a sheet cake for my sons birthday. But am nervous cos never made it any time. Can you share some tips also. Hello… can i use buttermilk instead of milk? Hi does it matter if I use salted butter instead of unsalted? You can use salted butter. For this recipe I preferred to use unsalted. I have a 16in x 12in pan. Would you have any idea if this recipe would be enough or would I have to double the recipe? 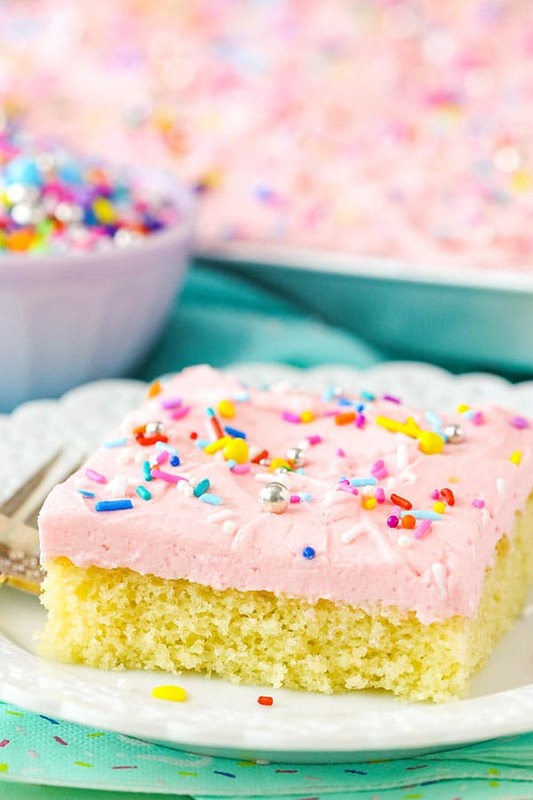 Used this recipe for double layer sheet cake for kids birthday party – absolutely delicious. So moist. A lot of compliments. I used Earth Balance and Ripple milk to make it dairy free. Will definitely be my go to cake recipe. Thanks! 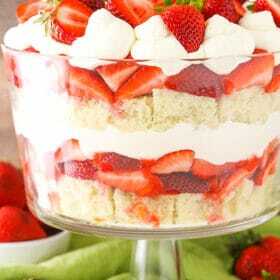 Could I use 9 inch rounds and make a layer cake from this recipe? I haven’t tried, but it should be okay. I would use my Moist Vanilla Layer Cake recipe for reference. Hi Lindsay, I just finished my vanilla sheet cake to have for dessert tonight to celebrate Valentine’s Day. It looks great, I can’t wait to taste it. Thanks for the recipe. Happy Valentine’s Day :)! Hi Lindsey, I just finished baking your Vanilla Sheet Cake for Valentine’s Day dessert. I colored the frosting Rose Pink, and covered it with a beautiful Valentine’s Day Sprinkle melange. It looks beautiful! I can’t wait to taste it. Thank you for the inspiration, and thank you for the recipe. Happy Valentine’s Day :)! That sounds fun! I hope you enjoy and Happy Valentines Day! I have an 11 X 15 sheet pan. Will this recipe work with this size? I haven’t used that size pan, but you may have extra batter. If you use all the batter, you would probably need to bake it a little longer. I hope that helps! I thought the result was a bit bland – if I were to make again, I’d add more sugar and vanilla. I did really like the light texture, however. How far in advance could I make this cake? Trying to time my baking between full time school and work. I usually only make things a day ahead, but if you really had to you could stretch it to two. I made this cake for my grand-nephew BD and everyone loved it. Do you have a recipe for a chocolate rather than vanilla? I’m so glad you enjoyed it! I don’t currently have a chocolate sheet cake, but this cake might work in the same size sheet pan. How would I make this in a 9×13 size? I need it to be 9×13 and about 3/4 inch thick (because I am stacking 6 layers on top to make a rainbow cake)! Thanks in advance! I’m not sure about making that thick, specifically, but you could try cutting it in half and doing the 9×13 pan and see how it does. Does the powdered sugar need to be sifted? I don’t usually sift it, but you could if your powdered sugar has been sitting a while and needs it.